How do you see the SPX closing on Wednesday (1/30)? Congrats to @rStock the Stockaholics Daily Stock Pick Winner for (1/29)! On to the next! 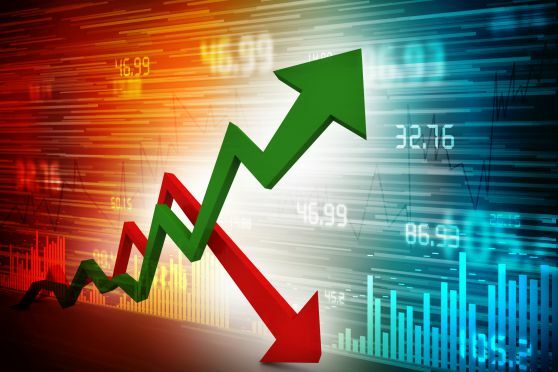 The Stockaholics Daily Stock Picking Challenge for (1/30) starts at the opening bell on Wednesday, January 30th, 2019. Remember...the challenge starts at the opening bell on Wednesday, January 30th! How does Stockaholics think the S&P500 will close 1/30? No daily poll tally for Stockaholics on Tuesday. Credit goes to the FLAT/DOWN votes! 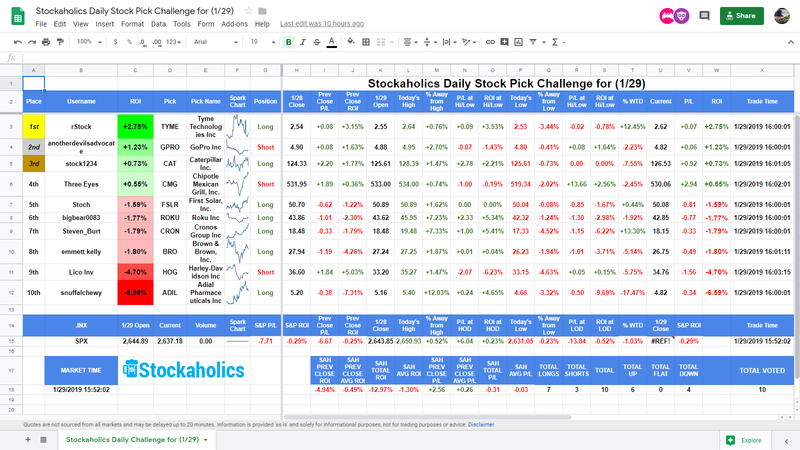 Congratulations to today's daily stock pick winner and 7th time winner of the daily stock pick challenge in 2019 (7th time winner in January!) -- @rStock! Some worthy mentions also go out to our 2nd place winner -- @anotherdevilsadvocate and 3rd place winner -- @stock1234! 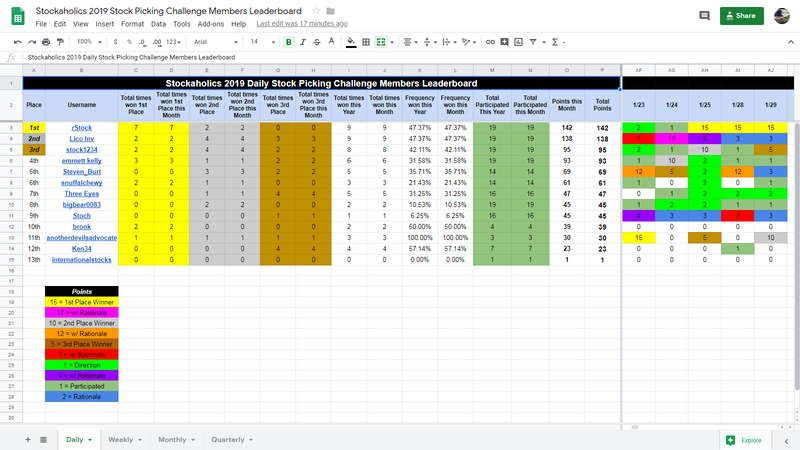 Best overall daily stock picking challenge winning percentage leader this year belongs to @rStock and @Lico Inv at 47.37% winning percentage in 2019. Best overall daily stock picking challenge winning percentage leader this month belongs to @rStock and @Lico Inv at 47.37% this month. Longest active daily poll winning streak belongs to @bigbear0083 with 2 straight correct daily market calls. 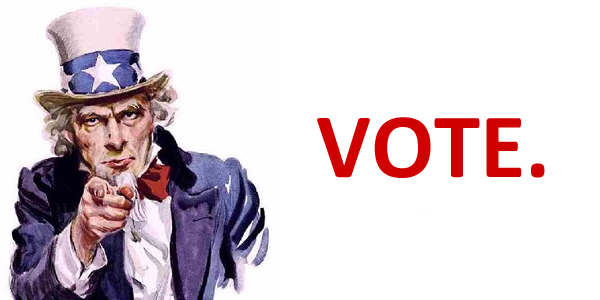 Best overall daily poll percentage leader in 2019 belongs to @stock1234 at 73.68% daily poll voting accuracy this year. Best overall daily poll percentage leader this month belongs to @stock1234 at 73.68% daily poll voting accuracy this month. Notable mentions goes out to @rStock with the current Stockaholics high of 3 straight 1st place finishes! Very nice. Since we're coming in to month end soon, this also gives me an opportunity to post up the leaderboard for the daily stock pick. It's a dandy heading into the final 2 trading days of the month! @rStock has just overtaken @Lico Inv for 1st place, albeit by just 4 points! Who will take home the first daily stock picking leaderboard win of 2019? Stay tuned in a few days to find out! just posted this bit of stat over on this week's daily market discussion thread. the spx currently on a 7-day loser streak on "fed day", longest ever. will be interesting to see if we finally break the streak tomorrow. my thinking is that we will. (Compared to the several hours of being open through the Business Hours. @snuffalchewy You must be a fan of Penny stocks (you pick them so often). i just thought i would point out that it looks like we have set a new 2019 high on participation for today (11). very nice! i think our all-time record on participation ever for the daily pick was something like 14 or 15 from 2017, so we weren't actually too far off from that haha.